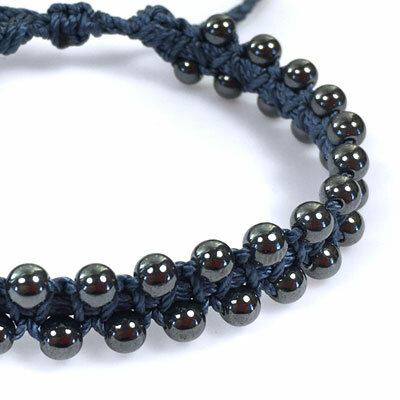 Hematite beads are interspersed at regular intervals along the edge of a knotted nylon center band. The hematite beads are man-made. The center band is knotted with nylon in a indigo color reminiscent of dark denim. The ends are knotted. One size fits all. 4 mm hematite. Nylon cord. Sliding closure. Adjust to wrist size. Can be stacked.